[Jerusalem] – Alarmed by the impact of “crumbling” Middle Eastern nations on Europe and the United States, and convinced that the devolving situation demands an affirmation of common civilization by those threatened, 150 participants from the United States, Israel, Europe and New Zealand spent two days reviewing the growing gap that distinguishes those committed to freedom, the rule of law and private property rights and relating the common challenges to the Middle East and the bases of the US-Israel relationship. 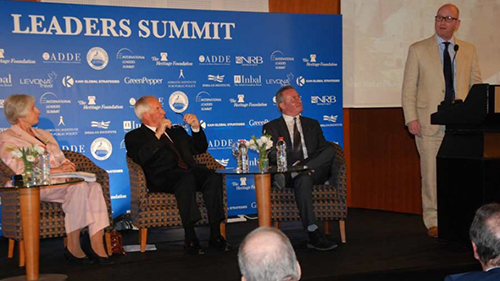 The Jerusalem Leaders Summit met for two days with an eye toward taking the sessions back to Washington in order to distribute their content through targeted marketing to people and institutions, teaching what the common bonds are and providing them with a “basis for further discussion, further research and further knowledge of the United States – Israel bonds,” Becky Norton Dunlop, Vice President of the Heritage Foundation, an organizer of the event, told The Media Line. Other organizers include the International Leaders Summit, the model for the event; National Religious Broadcasters, the umbrella organization uniting thousands of Christian broadcast entities; Family Research Council; and Alliance for Defence of Democracy in Europe (ADDE). In a departure from the format used by countless conferences espousing support for the state of Israel, the Jerusalem Leaders Summit articulated freedom, the rule of law and existence of rigorous private property rights as the threshold for membership among the civilized. Session moderator Steve Linde, executive editor of the Jerusalem Post, deftly managed a passionate Q-and-A when some attendees seemed impatient to move from the theoretical understanding to discuss the topic’s application to Israel. The applications were soon to come, with speakers focusing on the four areas chosen as symbolic of the sound underpinnings of the relationship between the two nations. “We understood there are serious challenges in the Middle East and we are here to affirm our ties, our partnership with Israel,” Joel Anand Samy organizer and co-founder of the Summit told The Media Line. He expressed concern that Israelis wonder whether they can still trust the United States following the raucous relations during the Iran nuclear debate. According to Dunlop, Israel and the United States are bound by the concept of economic freedom; the shared need for a strong commitment all the fire to security and defense; the rule of law and property rights (which we were to learn is shorthand for “life, liberty and private ownership); and innovation, an area in which Israel has excelled far beyond nations much larger.